Thanks to Frank-Olme Speck and Wolfgang Wendland there are now more than 100 pictures availble of the IWOTA 2010 meeting. Welcome to the 21st International Workshop on Operator Theory and its Applications (IWOTA 2010). IWOTA 2010 is intended to be a comprehensive, inclusive conference covering all aspects of theoretical and applied operator theory. The conference will be held from Monday July 12 through Friday July 16, with Sunday July 11 as arrival day and Saturday July 17 as departure day. IWOTA 2010 is preceded by the 19th International Symposium on Mathematical Theory of Networks and Systems (MTNS), which is held from July 5 - 9, 2010 in Budapest. With deep sorrow we realized that Israel Gohberg is no longer with us. 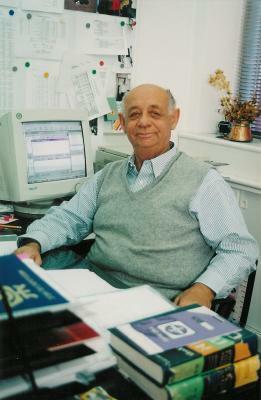 On Monday, October 12, 2009, Israel Gohberg, president of the IWOTA Steering Committee, passed away at the age of 81. Israel Gohberg was the visionary and driving force of IWOTA. Under his leadership, from the humble beginnings in the early 80's, the IWOTA workshops grew to become prime events in the community of researchers in operator theory and applications. Our community lost a great mathematician, a charismatic leader, a warm and generous personality. Israel Gohberg will be deeply missed.